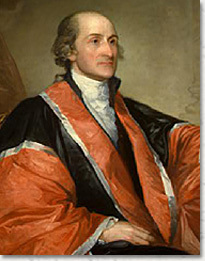 John Jay graduated from King's College (later known as Columbia University) in 1764, and was admitted to the New York bar in 1768 at the age of 23. He established a prosperous law practice in that city and six years later married the daughter of the governor of New York. Though initially cautious about the colonial independence movement, he joined wholeheartedly in the revolutionary cause once it was firmly launched in 1776. He helped draft the first constitution of New York State and was elected the state's chief justice in 1777, occupying that office until the end of the following year. He served as a delegate from New York to both the First and the Second Continental Congress and was elected president of the Congress in 1778. He traveled to Spain in 1779 as representative of the colonies but failed to obtain loans and other assistance in the war against the British. In 1782 he joined Benjamin Franklin in Paris, where he engaged in secret talks with British representatives and was able to gain concessions that were later incorporated into the Treaty of Paris (1783), by which England granted independence to the American colonies. When Jay returned to New York in 1784, he was quickly drafted by the national Congress as secretary of foreign affairs, a post he occupied until 1790. Frustrated by the impotence of central government under the Articles of Confederation, Jay was an early and vocal advocate for a strong federal government with effective executive and judicial branches. After the framing of the Constitution of the United States of America in 1787, Jay wrote five essays in THE FEDERALIST defending the new, more vigorous central government structure. In 1789 President George Washington asked Jay to become his secretary of state, but Jay declined. Washington then proposed that he become the first chief justice of the Supreme Court. Jay accepted, hoping that the Court would ensure the supremacy of federal law over that of states. Popular antifederalism, however, undermined the influence of the Court, and circuit-riding duties burdened its justices. Several of his judicial opinions helped articulate a rationale for the federal court system, but after Georgia defied the landmark decision in Chisholm v. Georgia (1793) and Congress passed the Eleventh Amendment limiting federal judicial powers, Jay concluded that the Court was doomed to be an ineffective branch of government. In 1795, he ran for and was elected Governor of New York, and resigned his post on the Court. One New York newspaper referred to the move as a "promotion." In 1794, while still sitting on the Court, Jay sailed to England at President Washington's request to help settle grievances between the two nations. The resulting treaty, the Jay Treaty (November 19), aroused such a storm of protest that Jay joked he could travel by night all the way from Boston to Philadelphia just by the light of his burning effigies. In 1800, President John Adams renominated Jay to the Supreme Court. Jay was confirmed by the Senate, but he declined the offer, stating that the Court lacked "energy, weight and dignity." He retired to his farm in Westchester County, NY, where he lived quietly until his death in 1829.